The Galt House Hotel is proud to be the Official Host Hotel of Churchill Downs and the Kentucky Derby. Located in the heart of downtown on Louisville’s vibrant waterfront and just minutes from Churchill Downs, the iconic hotel is the place to stay when visiting Kentucky. Book early! Rooms fill up fast the first Saturday in May. Louisville’s only independent hotel offers a truly authentic, exciting experience with a 3-night stay starting with a Call to the Post Party on Opening Night of Derby weekend. 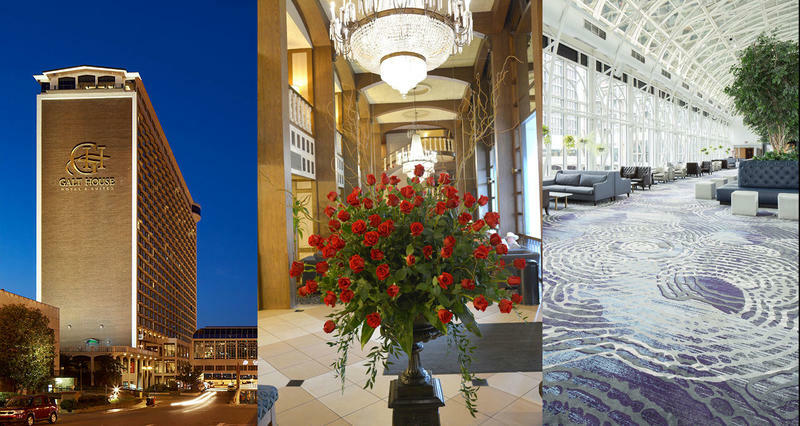 Fashion, mint juleps, roses and boutiques are some of the many extras you'll only experience at the Galt House Hotel. Go to GaltHouse.com to book your package. For groups requiring ten guestrooms or more, contact Kayla Harper, K.Harper@GaltHotel.com or call 502-561-4021. For individual packages contact Elizabeth Broadway, EBroadway@GaltHotel.com or call 502-584-5600. If you are coming to town for the September, Fall, or Spring Meet or a special event at Churchill Downs book your hotel reservation at www.galthouse.com.